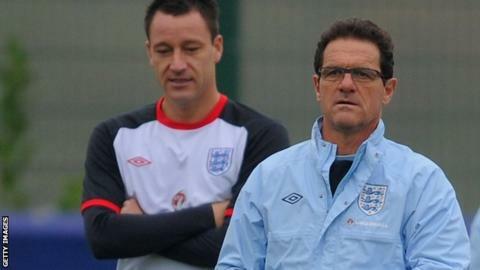 Chelsea captain John Terry should still be playing for England, according to former national boss Fabio Capello. Capello resigned in February 2012 after Terry was stripped of the captaincy by the Football Association over allegations of racial abuse following an incident with QPR's Anton Ferdinand. Terry, 34, was acquitted after a trial in July 2012 but was banned for four games and fined £220,000 by the FA. "It's better to have a player like John Terry than not," said Capello. "He is one of the best." Terry, who won 78 England caps, retired from international football in September 2012, saying his position in the national squad had become "untenable". He has been an instrumental figure this season for Chelsea, who are on course to win a fourth Premier League title. Capello, speaking at the Laureus World Sports Awards in Shanghai, said: "England haven't got a lot of defenders but they sometimes have problems. "But I don't think he has the chances to play with the national team any more." Capello, appointed England boss in December 2007, has been managing Russia since July 2012.